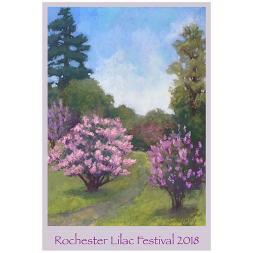 Today the poster for the 2018 Rochester Lilac Festival, presented by Five Star Bank, was revealed. This moment in time marks the final countdown to the highly anticipated annual event, which is now less than a month away. This year’s poster was commissioned by local artist Katheryn Bevier, who drew upon her personal experiences at the Festival and her appreciation for the natural landscape of Highland Park to create the picturesque scene. The 120th anniversary of the Rochester Lilac Festival will kick-off with a special tribute to our hometown veterans, active military, and service men and women. Festival organizers shared an open invitation during the press conference for these hometown heroes to join the opening ceremony on Friday, May 11. During the opening ceremony, Festival organizers and partner organizations will share “thank you” messages to those who have/are serving and reveal the “USA Flag Garden,” where the community can, for a donation of their choice, “plant” a flag to help spell out U.S.A. After revealing the garden, veterans in attendance will be given a flag to “christen” the garden along-side Festival organizers. The flag garden will be open for the duration of the Festival (May 11-20), staffed with volunteers from Honor Flight, who will be receiving the proceeds. With more than 150 acres of gardens at Highland Park with a variety of flowers, trees, and plants like sweet magnolias, azaleas, and pansies. “It’s a park for all seasons and all reasons,” said Festival Producer Jeff Springut. Rochester Lilac Festival has a wide variety of free concerts, with more than 80 musical acts during the 10-day Festival. Visitors are sure to find something the whole family can enjoy. In addition to the major music performances previously announced, many local acts will also grace the Sahlen’s Center Stage. Local performances include Danielle Ponder and the Tomorrow People, Steve Grills and the Roadmasters, Sisters of Mercy, MoChester, Jumbo Shrimp and many others. Festival Producer Jeff Springut also shared the continuation of the Festival’s partnership with Five Star Bank as the Presenting Sponsor of the Rochester Lilac Festival, now in its second year. “Five Star Bank has planted a proverbial Money Tree at the Festival and will once again be giving away a $5,000 cash prize at the Festival this year. To enter, visit the Five Star Bank booth located near the Traffic Circle entrance,” said Festival Producer Jeff Springut. "The Lilac Festival is a time-honored tradition that showcases the outstanding quality of life we enjoy here in Monroe County. With over 500,000 visitors making an estimated $3 million impact on our economy, Lilac Fest also helps support local jobs for our friends and neighbors. I&apos;m proud to join our partners and sponsors for another year of free family fun at the 120th Lilac Festival. I look forward to seeing everyone at Highland Park!" Thank you to our generous sponsors; Five Star Bank, Delta Air Lines, Sahlen’s, Genesee Brewery, Labatt USA, Pepsi, Ava Grace Vineyards, Casa Larga Vineyards, Black Button Distilling, GreenSpark Solar, Electrification Coalition of Rochester, Five Star Urgent Care, Spurr Subaru, Dunkin’ Donuts, Goodwill of the Finger Lakes , Frontier Communications, House of Guitars, Medved Running & Walking Outfitters, McCarthy’s Tents & Events, Excellus Blue Cross Blue Shield, US Track & Field, Woodcliff Hotel & Spa, Country Inn and Suites Pittsford, Staybridge Suites University of Rochester, WROC-TV Channel 8, iHeart Radio, Stephens Media Group, and Spectrum News.